Under a mile from our home and we never knew Watchetts Lakes existed. Only another geocacher can appreciate the excitement we felt when we saw that a small series of caches had been placed very close to our home. 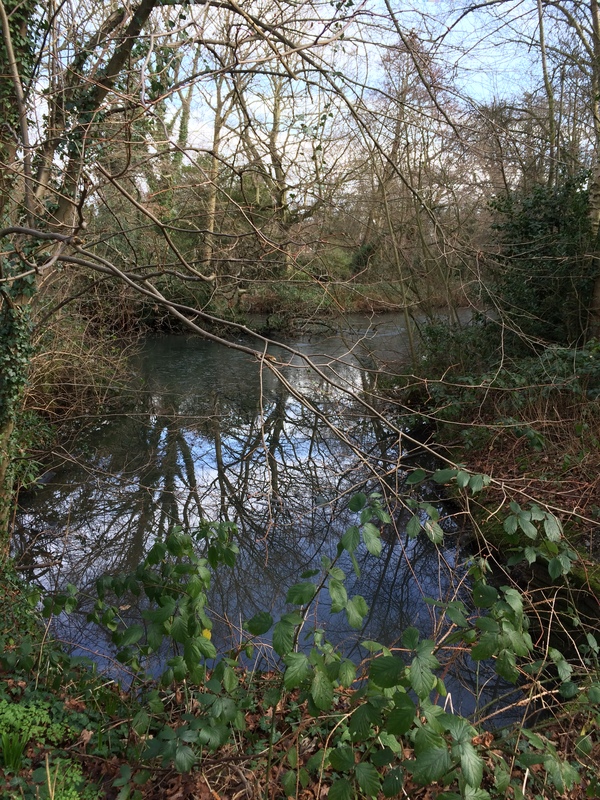 The CDW (Camberley Dog Walk) series, #1 to #5, was only published on 10th January 2016 and on our first available day we hurried to the start which was in nearby Heatherdale Road. The FTF for this series had been Coin-Man. This is a name we have so often come across on logbooks during our geocaching career that sometimes we felt that we had been following him. Hopefully, one day we will bump into him either at a cache or a local meet and see who he really is. CDW #1 was a very sneakily hidden cache and the CO gommezcrew had taken their time to make a suitable cache container which is much nicer to find than just a micro or magnetic tube. I’m not giving away too many hints or clues to these finds as it will give the game away to any who are following in our footsteps. Part of the beauty of this series is in the different containers used. The route to CDW #2 took us along a couple of roads we haven’t walked before, even though very close to our home. We found GZ easily enough and guessed where the cache would be hidden, but the crafty gommezcrew had made an even sneakier container for this log. We almost gave up looking for the container when I suddenly realized I had been holding it in my hand all the time !!! CDW #3 took us along a footpath into the woods. We soon found the area where the cache should have been but after twenty minutes or more of searching for a sneaky hide, we sat down to reflect and read the previous logs. An earlier log stated that it was in full view, but completely hidden – how perplexing. The two previous caches had been good, but this was even better. So good in fact that we awarded it a favourite point. It’s amazing that when you know what the cache looks like, how simple it is to see, but how difficult it was to find. Well done gommezcrew. Now for #4. By now, we were walking around Watchetts Lakes; it wasn’t too muddy but very cold. As we approached GS we spotted two muggles acting quite suspiciously. They didn’t move on as we approached and were poking about in the shubbery next to the lake so we decided to ask them whether they were geocachers. Surprise, surprise, it was Grannymeeks who we had met last year at our very first Meet in the local pub. She was searching with her husband and even with four pairs of eyes we had trouble finding the hidden cache. Eventually I spotted something which led to the cache (again no clues to spoil the fun) and we all agreed that it was an extremely good hiding place and a great (not so little) container. Part of the clue for the previous cache had been “be careful where this cache is hidden it bites…” so you can imagine our surprise/caution/almost shock when we came across this ‘monster’ in the lake. The monster from the deep !! Surely I cannot be the only one who thinks that this looks like a crocodile ! In a lake – in Surrey !!! Okay ……….perhaps not. Regrettably, we had to bypass CDW #5 as there was a group of people nearby who wouldn’t move. We hung about for as long as we could, but they were cemented to the spot and didn’t realize they were holding up serious geocachers !!! It’s a definite for another day – a quick grab (hopefully). We made our way homewards suddenly realizing that we would be passing very close to a previous DNF. Cricket Pitch Micro #15 – Camberley had us stumped in our early days of geocaching and we were determined that now we were seasoned cachers, we should be able to find it. We walked straight to it …………….. which was either very good luck this time, or total inexperience last time but we were so happy to cross a DNF off our list. This thoroughly enjoyable walk took place on 16th January. Well done to gommezcrew for taking the trouble to make each cache different and perplexing. We look forward to finding #5 shortly. This entry was posted in Caching, Camberley, DNFs, Geocaching, Watchetts Lakes and tagged Caching, Camberley, Geocaching, Watchetts Lakes. Bookmark the permalink. 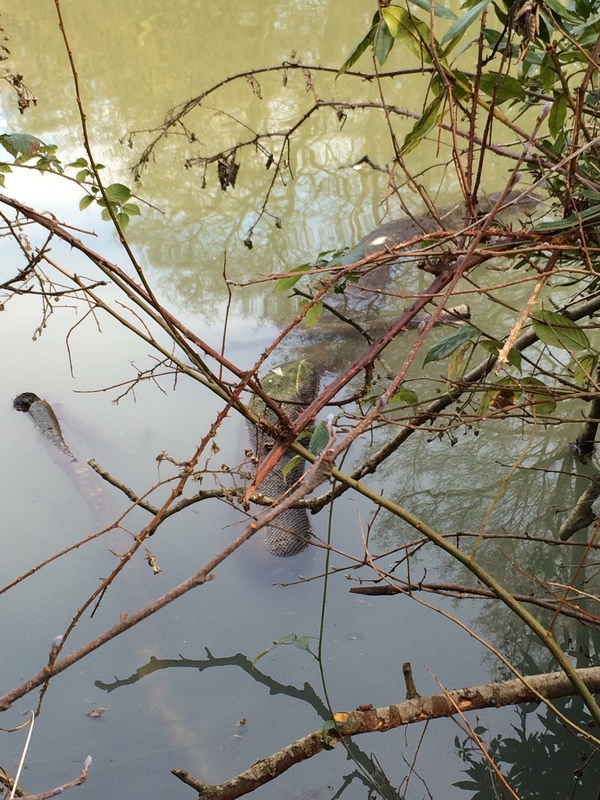 4 Responses to A Crocodile in Surrey ??? Looks like a good series – maybe we’ll have that down for the weekend. We’ve just attempted this series. We failed at #2 (sand) and #3 (clearing near lake) despite spending at least 20 -30 minutes at each location. Like you we couldn’t attempt #5 (alleyway), as there was lady in her garden right next to GZ. Interestingly about 7 cachers have found #1 after you, but only a couple at each of the others. Maybe there’s been a few DNFs not being owned up to! We found the 3 in Queen Elizabeth Park, Farnborough today as well as one nearby which we missed last time around. Amazingly, picked up another 2 TBs. If you want a hint re #2 and #3 just ask.